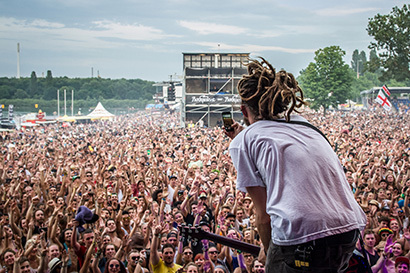 The SUMMERJAM Festival is one of the biggest Reggae, Dancehall and Hip Hop festivals in Europe. tolerant and peace-loving like-minded people at the SUMMERJAM Festival in Cologne, Germany. These tickets are not computer printouts, but are rarities amongst collectors and fans.With their high quality, individually created design these hard tickets are really unique. The E-ticket is available immediately after receipt of the payment. Either print@home or comfortably save it by smart phone in Passbook. From Autobahn A1 (at junction Köln-Niehl) take the Industriestraße to roundabout; from here, follow the Bremerhavener Straße. Cars follow the Militärringstraße, turn right to Mercatorstrasse, then right to the parking places. There are sufficient parking spaces available at the central parking lot. We will be providing new and larger parking areas. Please make sure to follow the parking lot signs (traffic guidance system), which will guide you the quickest way to the parking lot. The parking fee for the festival weekend is €20,- (single entrance). Guests who want to leave and re-enter the parking lot during the festival should contact the parking staff, make a one-time payment of €30,- and acquire a special multiple entry parking pass. The Cologne tow-away services charge about Euro 150,- per car. Only use the signposted parking areas and form car pools. As of Wednesday, July 03rd (09:00 am) until Monday, July 08th (12:00 pm). In advance campers arriving on Monday or Tuesday will have the opportunity to unload at the camping entrance on P2. Further parking information is provided on site. We arranged KISS & RIDE stations for all festival visitors who want to be taken to and/or picked up at the festival. 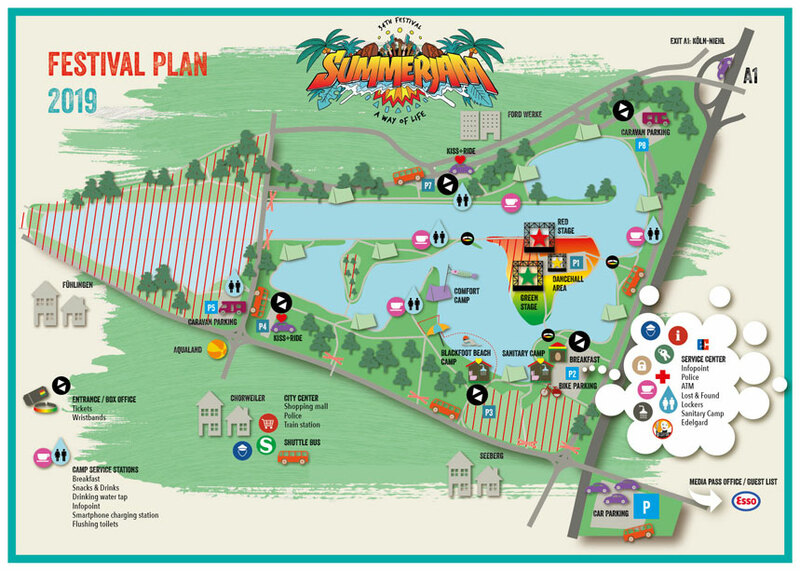 Just watch out for the suitcase symbol on the festivals site plan in order to keep your arrival and departure uncomplicated. S-train S11 to ‘Chorweiler‘, change to bus 122 until bus stop ‘Seeberg’. 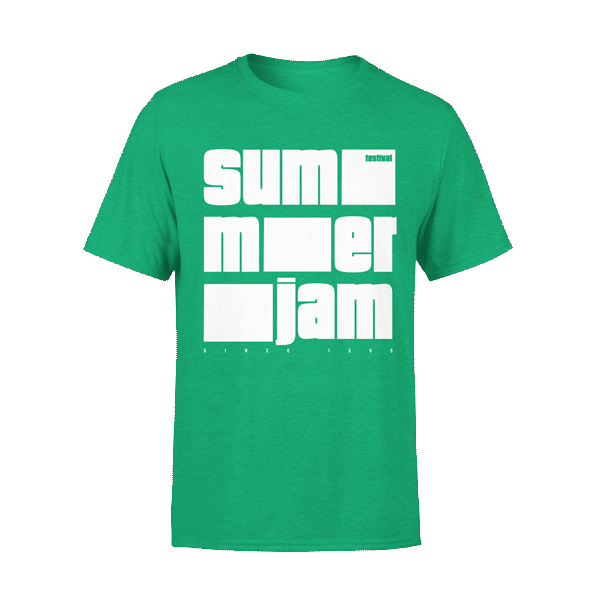 The official SUMMERJAM shuttle can only be used with a valid ticket or festival wristband. You will find an overview of the bus stops of the shuttle busses on the area map. More busses will be scheduled for arrival and departure times. From Thursday to Saturday a bus shuttle will be additionally available from the SERVICE CENTER to the CITY CENTER “Chorweiler” (super market). Information about the timetable can be found at the Service Centre. To get an overview of the bus stops, please use the area map. PLEASE TAKE NOTE THAT THE BUS COMPANY “KVB” USE THEIR OWN BUSSES AND WHICH ARE SUBJECT TO CHARGES! RIDING WITHOUT A BUS TICKET COSTS EURO 40.- ! On the parking area P2 (nearby the Service Center) you will find our bicycle parking area. Where you can lock up your bicycle for free (festival ticket holders only). The closest airport is Cologne/Bonn. The airport is about 30 km from the Fühlinger Lake. The airport is about 50 km from the Fühlinger Lake. CAMPING WITHOUT A VALID WRISTBAND WILL NOT BE ALLOWED! The 3-day festival ticket also includes access to the camping areas starting from Thursday July 04th from 8.00 am onwards - this means there will be NO additional charges for camping! Only SUMMERJAM visitors with a valid ticket or a valid festival wristband have access to the camping area! Please take note of the section "Camping Areas". There is generally no entitlement for the provisioning of a certain camping space. Wild camping is prohibited and will be rigorously enforced by the police and the security staff! Every visitor wishing to gain access to the festival - which also includes the park and camping areas - must have a valid access authorization in the form of a festival ticket or a worn festival wristband. By way of precaution we inform that individuals gaining access to the grounds without such proof of authorization will be prosecuted for acquisition of services under use of fraudulent means (§ 265a StGB, German penal code) and unlawful entry and breach of peace (§ 123 StGB, German penal code)! as such: The digging of tent boundaries or the digging of holes in the ground represent damage to property and will be prosecuted by the police and by the security service. The festival grounds are located in a local recreation area, respectively nature park and are therefore not just fields or an adventure playground. Please note the opening hours of each Camp area. No camping is allowed in the area of the Fühlinger Lake before Monday, July 1st. The city of Cologne will undertake measures against wild campers. Starting from Monday, July 1st the areas C2, C3, C4 will be open for the in advance campers. Starting from Wednesday, July 3rd ALL camping areas will be open to our guests with a valid Festival ticket. The fee per person/day is €15. From 8 AM on Thursday, July 04th camping is free of charge. On all days camping wristbands must be collected at the access points to the camping grounds in exchange for the Festival ticket. Camping is not permitted without a valid Festival ticket. Camping is NOT allowed before Monday, July 01st but there will be separate areas for those already arriving from Monday onwards. There will be a service fee per person/day for the use of the camping grounds until Thursday, July 04th ( 8:00 AM ) – and again: there is ONLY access with a valid Festival ticket / wristband! Starting from Monday, July 01st the areas C2, C3, C4 will be open for the in advance campers. Starting from Wednesday, July 03rd ALL camping areas (C1-C6) will be open for the in advance campers. Greener Festival is a European-wide movement with the goal to motivate guests of large events towards a more ecologically sensitive handling of nature. The entire waste from the festival is sorted for recyclable parts at a sorting plant. Together with our garbage disposal company and you -our guests- we try to offer you garbage disposal concepts that make collection easy for you and which take the burden off the grounds – see „Garbage“. Furthermore, for our ecologically aware visitors we offers the Green Camp (C5) – see „Camping Areas“. The Fühlinger Lake is a nature preserve where we are guests for a weekend. Please collect your garbage and leave your camping site just the way you found it. We provide an unlimited amount of garbage bags at the entrance and exit areas. You will find "garbage enclosures" on the camping grounds. Please deposit the garbage bags there. We will transport them away from there. Our Camping Security and the Camp Service Stations will always have free garbage bags available for you and will always help you out with advice or anything else you need. Keep Cologne Bay Clean – “leave only footprints”. In 2019 Blackfoot Beach offers its own BEACHCAMP. Thanks to the offered all-round carefree package you have the chance to experience a relaxed and stress-free weekend with real beach vibes and your toes in the sand. Included are a set-up tent, lighting, a discrete security check and much more. Those that like to enjoy some peace and quiet and cleanliness whilst camping can look for a space in the Green Camp (C5). For families with children, we continue to provide a separate area. Please specify when booking! It is now possible to book your own caravan lot on P8 online in advance. P5 – quiet, with flush toilets, allocation of caravan lot on site. The caravan lots are 5x6 meters (65€/per lot). P8 –Incl. electrical connection (220V max.) within 50 meters, addtl. Porta Potties/portable toilets. You can choose from caravan lots classified in Luxus (5m x 6m) & Business (5m x 8m). Please keep in mind, every fellow passenger needs a Festival ticket to access the Caravan parking areas. The Caravan Areas will open on Wednesday, July 4th at 2 PM. Additional tent camping is not allowed on the Caravan Areas. Station wagons or reconstructed cars aren’t allowed and entry won’t be granted even if you have booked a Caravan parking lot. The CAMP SERVICES in all the camping areas provide you with water flushed toilets with 24 hour service. For a single payment of 5.00 Euro for the whole festival duration you can purchase a „flatrate band“ and thereby have permanent access to all the water-flushed TOILETS. Of course the normal mobile toilets (Dixis) are distributed as usual for free use over the entire camping grounds. At Service Center P2 showering facilities with warm water have been installed and can be used for a service charge. Due to recent events we have intensified the security control at SUMMERJAM. At arrival to the SUMMERJAM area there will be preliminary inspections. Last year we fenced in the entire camping area and only guests with a valid ticket could enter. Which resulted in reduction of tent thefts by 70%. We will continue with this concept this year adding an improvement: you'll be able to get your Festival wristband at all Camp access points, which means less standing in line and waiting time. At the Festival island access points there will be intensified controls as well. All measures are synchronized in close collaboration with our and your partner - the police of Cologne. Our security personnel and the police will be ever-present in all areas. If you notice something or have any questions, please do not hesitate to contact us. • For safety reasons open fires, which also means grills in any form, are strictly prohibited on the camping grounds. 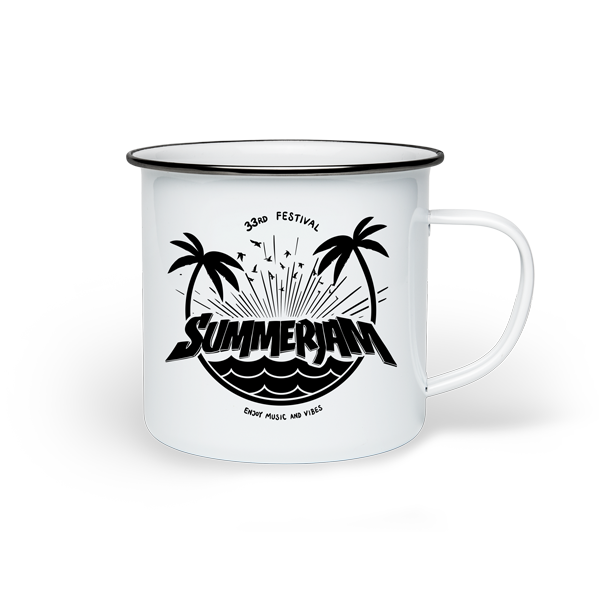 • It is not permitted to take animals/pets to the SUMMERJAM, neither to the festival island nor to the camping grounds. • It is forbidden to take glass bottles into the whole camping and festival area. You can only take beverages with you in Tetra packs or P.E.T./plastic bottles . • The use of sound systems and generators is not permitted on the entire grounds. In case of doubt we will have to ask you to leave the grounds. • The operation of trading stalls on the camping and festival grounds is only permitted with the explicit permission of the event organizer. The controlled substances act (BtMG, German narcotics act) of course also applies on the entire festival grounds. • The handling of cannabis products remains fundamentally illegal and transgressions will be subject to prosecution. • No aggression or violence. The camping ground is limited at the Fühlinger Lake and for festival guests ONLY. For each guest an area of 5 square meter (53 square feet) is available. Please do not build huge pavilion or gazebo "forts" or private chill out-areas with a group of people. Otherwise we might have to ask you to take it down in order to make sure there is enough room for all of our camping guests. The Fühlinger Lake is a nature preserve where we are guests for a weekend. Please collect your waste and garbage and leave your camping site just the way you found it. We provide an unlimited number of garbage bags at the entrance and exit areas. You will find "garbage enclosures" on the camping grounds. Please deposit the garbage bags there. We will transport them away from there. 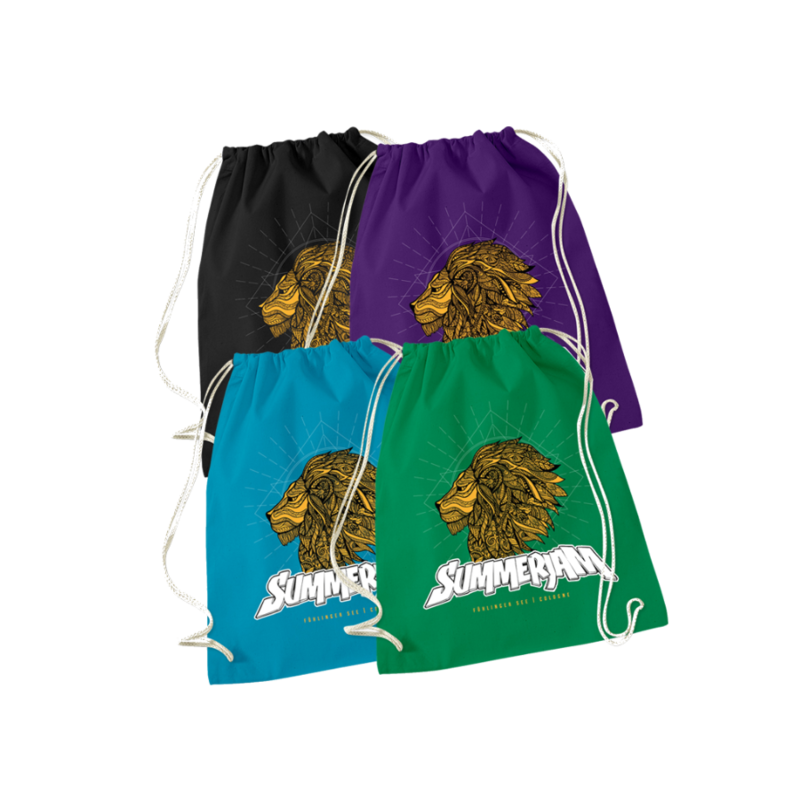 Our Camping Security and the Camp Services will always have free garbage bags available for you and will always help you out with advice or anything else you need. Still photography for personal, non-commercial use is permitted. Audio and video recordings are NOT permitted and any violation will be prosecuted. Please leave your professional digital or analogous single lens reflex camera at home - they are also NOT permitted on the festival grounds. On the camping grounds there are no restrictions regarding photography, audio and video recordings. At the festival there will be taken photos and video recordings by accredited media outlets, journalists and the promoter. These recordings will be duplicated and used for media coverage and documentaries - distributed via print, DVD, TV and online. By entering the festival grounds you declare your agreement to possibly be recorded and that these recordings might be used as stated above. There will be NO compensation. The use of tripods and selfie-sticks is also NOT allowed on the festival grounds. There are lockers from Carderobe Service in different sizes available (at parking area P2 - in front of the entrance). Thursday til Sunday from 10.00 am til 01.00 am. Like every year countless helpers, orderlies, policemen/women, DLRG and friends will be supporting the festival organization and will be at your side in the event of any problems arising. On the island and in the camping area (overview plan) a respective paramedic station will be installed and run by the ‘Knights of St. John’ first aid organization. In the event of any health issues, please contact our competent staff/helpers. Trained and experienced female personnel will help, listen and talk to you about options and next steps in case of assault, pestering or sexual harassment. Our security guards are available for you 24/7. - if you have been assaulted, pestered or sexually harassed. We have installed various rescue points spread over the entire camping grounds. These are clearly signposted and numbered. You will find an overview map at every Camp Service facility. - How many people were injured or are in danger? - What is your phone-number? Make sure someone stays at the rescue point as a contact person to instruct the rescue service when they arrive. It is mandatory to keep all access paths unblocked! – As these are rescue pathways for ambulances, fire department etc. that if necessary life can easily be saved – yours or that of your friend. We have installed deposit collection points in all CAMP-SERVICES – just leave empty bottles there and help the environment whilst doing it! Help us to make our camping ground safe! Due to tent break-ins in the past years we urgently request you to leave your valuables at home or to carry them with you. To prevent theft, we recommend that as soon as you have installed your tent you introduce yourself to your tent neighbours and mutually watch out for each other. A special camping security team will be proceeding against packs of thieves and illegal vendors in close coordination with the police. To prevent tent break-ins and thefts we have provided the "safe-deposit truck" for you on P2. These are secure and guarded safe deposit boxes for your valuables for a small rental charge! Stay safe! The entrance to the festival island is only possible with a valid festival wristband. Owners of forged tickets will not gain access to the grounds and must expect police enquiries. We recommend: Only buy tickets at official selling points! We will set-up our large Service-Station facility on the parking area P2. Starting from Thursday you will be able to exchange your tickets for valid festival wristbands. In addition to this we will be offering a large breakfast tent, showers and a sanitary camp, water supply stations, as well as our Infopoint, including „notice board“, lost & found, current program infos, as well as a small shop where you can buy this and that (toiletry articles, condoms etc.). After the festival the found or respectively handed in items will be passed on to the lost property office of the city of Cologne. Swimming is prohibited in the entire lake except for the open-air swimming area: BLACK FOOT BEACH. ATM machines can be found at the Zielturm (on the festival island), as well as at Service Center P2. It is not a problem if you want to take your own food to the festival island. Beverages are however only allowed in sealed 1 liter cartons/tetra packs per person. Glass, plastic bottles and cans will be rejected. For safety reasons there will be checkpoints at the entrances to the festival island where you will have to deposit any glass or metal containers that you may have with you. There is also free water at the P2 area, on the festival grounds near the toilet building (behind the bazar) and at the CAMPSERVICES around the camping area! There will be a 24-hour service available over the whole grounds. Food stalls from all over the world, as well as beverages from cocktails to soft drinks will be available, as well as also a breakfast tent and other stalls where you can pick up useful bits and pieces. In addition there is a supermarket at the commuter railway station „Chorweiler“, from where you can travel to the grounds with the shuttle. There is a CAMP SERVICE facility in all camping areas. Here you will find information, always cool drinks at fair prices and in the morning coffee and breakfast. Any selling of food and non-food items requires the authorization of the event organizer. 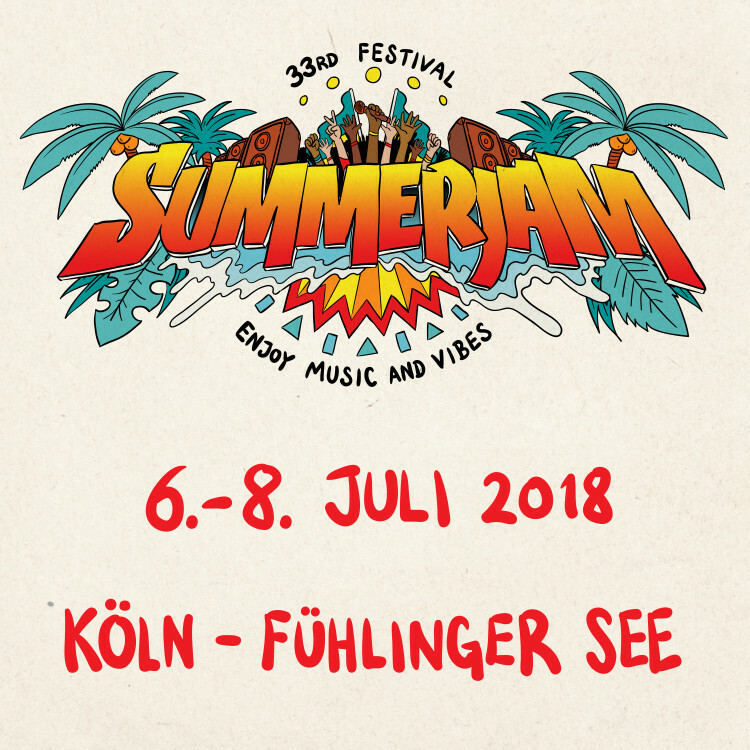 Persons with a severe disability with a valid ID-card (classified as B / Need for continuous supervision) enjoy free entrance at the SUMMERJAM Festival. Please send us an e-mail to mail@fuehlinger-see.com with details of the classification of your disability and a copy of the ID-card. If applicable, we will issue a personalized free entrance ticket for you. Please keep in mind: We can’t issue free tickets for supervisors / companions / attendants. WITHOUT PRIOR NOTIFICATION we cannot issue a free entrance ticket. Please note: Personalized free entrance tickets will be processed beginning of May 2019 at the earliest. There are toilets for people with a disability on the festival grounds at all entrances, as well as at the Camp Service facilities. Additionally there is a wheelchair-accessible platform in front of the RED STAGE. Children up to and including 12 years of age have free entrance (accompanied by a parent). Please take the children identity documents with you so that you can prove the age if you are questioned. We will create an action playground for the youngest Reggae fans. Please put name tags on your children (and add your mobile number). We can not assume responsibility for the little ones. Juveniles over 16 years and under 18 years of age are not required to leave the festival at midnight IF they are in the company of their legal guardian! Under 16 years of age is also not a problem IF they are in the company of their legal guardian at any time! Every person, who is responsible for the custody of child as a single person or together with another person according to the directions of the German Civil Code (father, mother, legal custodian), any other person older than 18 years, as soon as he or she undertakes the task of custody and has acquired the consent of the legal guardian. If a minor is being accompanied by a guardian then the guardian must be able to present the consent of the legal custodian in written form. This means for example if you have a chaperon with you (sister, brother, boyfriend/girlfriend…), and this person is older than 18 years old, and he or she is your legal guardian with written consent from the legal custodian and is looking after you, then you can stay at the event up to the time specified in the consent. Here you will find such a consent form as a .PDF file, which you only have to fill out with your own data. It has to be filled out completely, and together with your passport/ID card and the one of your chaperon you will not have any problems! It’s important that your parents/custodians give you a written consent with the transfer of the custodianship to another person for the entire duration of the festival, which you can then present in case it is necessary. 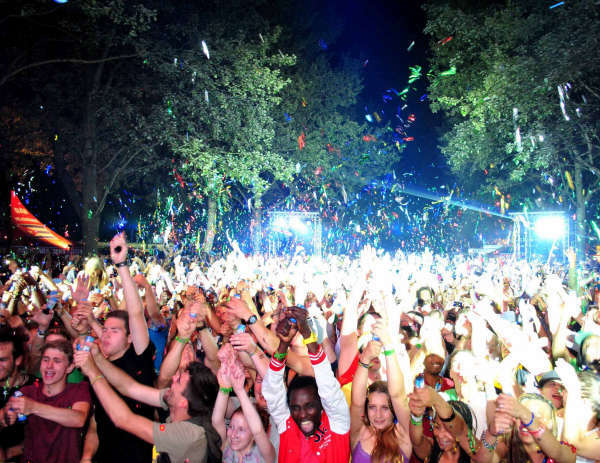 The weather at an Open-Air event is a constant companion for every visitor. Sometimes it´s a summer breeze, other times there are thunderstorms and heavy winds. The weather changes on short notice, especially heavy storms, thunder, hail and strong gusts. We will provide weather updates throughout the festival weekend including weather alerts of the German Meteorological Service (DWD). All updates will be available via our festival app, Facebook, Twitter and the video screens next to the stages. Essentially it is important to maintain self-competence. This means you have to inform yourselves about emergency exits and possibilities of rescue on the festival site. - During thunderstorms or storms the safest place to be is in a car. Please team up with other festival visitors. - In an open terrain please look for the lowest spot there and sit down with your legs drawn up close to your body. - Trees DO NOT protect! - DO NOT stand in groups! DO NOT hold hands! - DO NOT stay/get in the water! - Close your tents and secure loose objects before leaving the festival site. If there will be a bad weather situation, there is the possibility of a stage program interruption. Please follow the instructions and measures, inform yourselves as soon as possible about evacuation points and emergency exits. We will update you constantly via the festival app and on Facebook, if necessary via public address calls off the stages and alert messages on the video screens next to the stages. for current press releases, artist information, festival impressions and Logo please use our Media Lounge which is password protected. Our photo material can be used free of charge. The pictures may not be distorted or be represented in a way that changes the original meaning or context, and are exclusively for journalistic use. 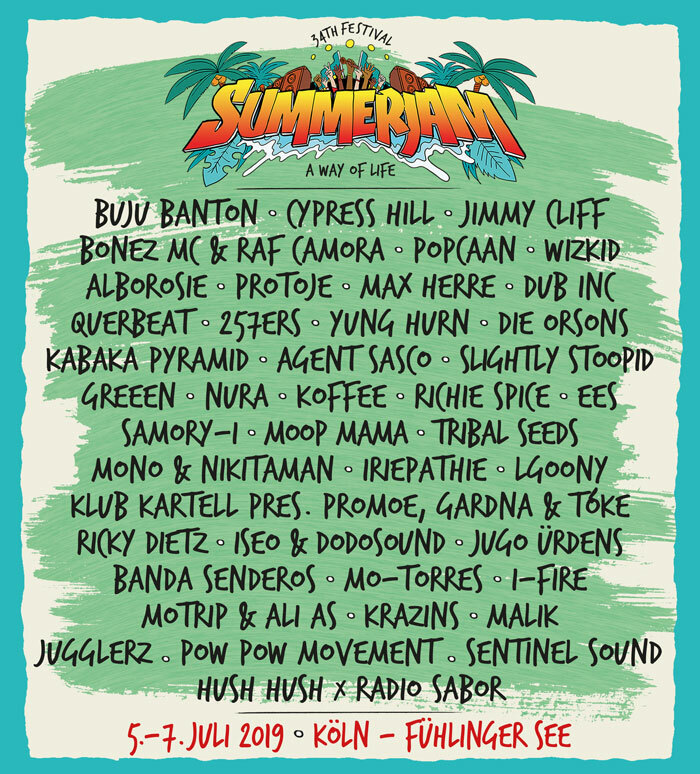 If you should use photo material from this page for publication purposes, then please specify "summerjam.de" as the source. If you are additionally interested in more high resolution graphics or other photo material about the festival, then please feel free to contact us.